I’ve finally got some good news for you Twilight junkies, The Twilight Saga: Eclipse is coming out on DVD and Blu-ray at long last! Here’s the big date to mark on your calendars – Saturday, December 4th! 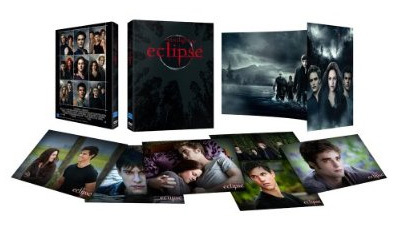 Just like the previous two movies, there are about 67496749 million versions of Eclipse you can buy – the single-disk DVD, the two-disk DVD, the special edition two-disk DVD, the single-disk Blu-ray… etc. On top of that, many stores carry different versions of the film, so you may want to research before you buy so you get the best one. Also, different stores offer different extras – for example Target offers six photo cards with their special edition version (pictured right), while Walmart offers an exclusive two pack set that contains both Eclipse and the Destination Forks DVD. Who here will be picking up their copy of Eclipse the very moment it’s released?